Cathy's Card Spot: Seahorse scenery. 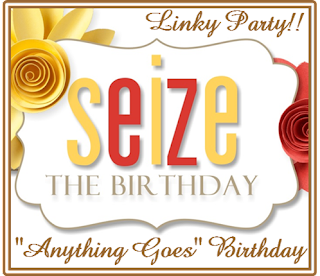 Hi everyone, I was so excited when Nancy asked me to be a party guest to play along at Seize the Birthday. It's one of my favourite challenges as I'm always needing birthday cards! 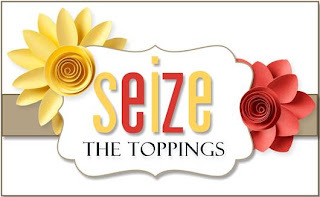 or, as always if you don't want to do the toppings it's anything goes as long as it's a birthday theme. I've had lots of fun playing with gesso and distress paint to create the background for the seahorse and starfish. Old cardboard boxes are no longer safe in my house lol! The creatures are inked with versamark and then embossed with frantage enamel powders in aged taupe and ochre. I cut down a cereal box to make a base with three sides as an "ëmbossing booth". It does a good job of containing the powder which tends to blow everywhere until it starts to melt. Scrap of corrugated card; gesso; weathered wood distress paint; Sizzix mini sand and sea and holiday greens dies; versamark ink; frantage embossing enamels; metallic rub on paint;sentiment sticker. Beautiful card Cathy and congrats on your Guest Designing at Seize theBirthday. Love how you did the seahorse and the sea with corregated card. Good for you designing for Seize the Birthday. That's a nice honor. The dark color on the corrugated box looks like waves and is so perfect with the mermaid. What a great card! Welcome Cathy! I love your first card with us. So simply fabulous. Congrats on the GD gig, your card is a stunner! So fabulous with the texture and layers. Love it. Welcome Cathy! So glad to have you with us over the next two months! Love your first card! I especially love the texture you have achieved! brilliant use of corrugated paper! Have a great day and Happy Mother's Day! Congrats on being a party guest over at Seize the Birthday! Love your mixed media piece framed by all this white space! Welcome Cathy, thank you for being our party guest over at STB!! what a fun card you made to share with all of us...your little seahorse is just adorable...they are such tiny creatures, aren't they? so glad you will be with us for a while sharing your talent with us! This is so fantastic! Gorgeous little ocean scene. So glad to have you joining us at Seize the Birthday. Glad to have you as our guest on Seize the Birthday. 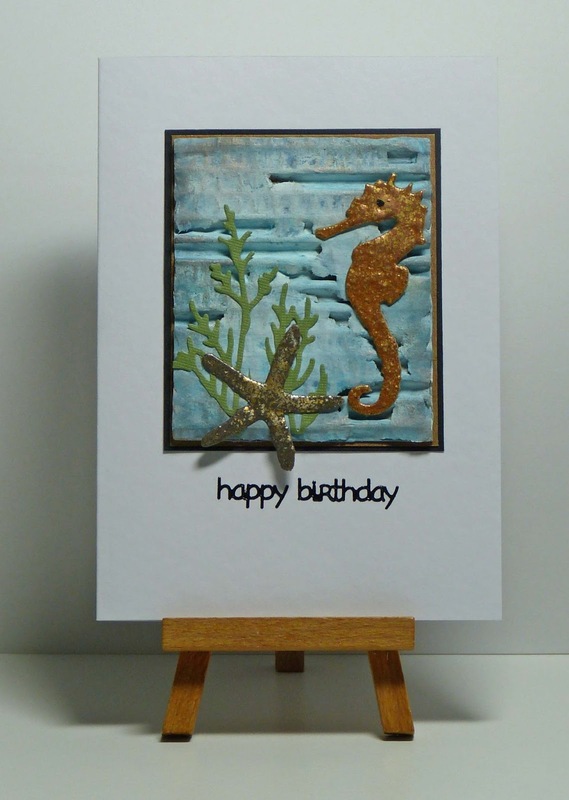 Love your card with the seahorse, and the great texture. Cathy, I just love the texture of your beautiful seahorse card! It was interesting to read about the frantage enamel powder too, something I've never used. So many craft products, so little time! So glad to have you as a guest at STB! What a fun card and I love the gorgeous texture.